The markets we serve tend to be either hi-tech or high on aesthetics, the latter recognizing the sales appeal of the packaging as in integral part of the marketing process. 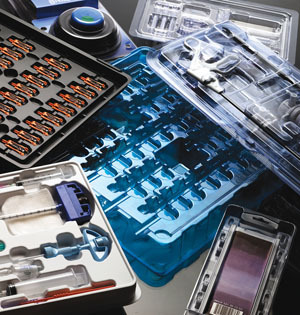 Medical industries use our packaging to pack precision instruments in sterile, safe, and easy access arrangements for the end users. We work with anti-static dissipative and conductive material formulations. Our customers determine the level of static protection required, and we take it from there. Our packaging does more than protect -- it also enhances the shelf appeal of consumer products.